Sierra Theaters is a locally owned, family business that operates Sierra Cinemas, The Del Oro Theatre, Sutton Cinemas, and The Nevada Theatre Film Series. Each theatre features comfortable seats, friendly staff, and state-of-the-art projection and sound. The popcorn is delicious, too! Mike Getz began his career in the movie business in the early 60’s. He created the first wildly successful midnight movie series in Hollywood in 1963 and helped launch the “Rocky Horror Picture Show” midnight movie phenomenon in theaters throughout the country. In order to view independent films locally, Mike and Barbara Getz started the Nevada Theatre Film Series in 1979. Mike’s talent to entertain the audience is evident in the continuing success story of this popular Nevada City Sunday night tradition. In 1989, The Getz’s opened Sierra Cinemas, a four screen, first run movie theatre in Grass Valley. In 2001, they opened Sutton Cinemas, a two screen theatre in the Brunswick Plaza. 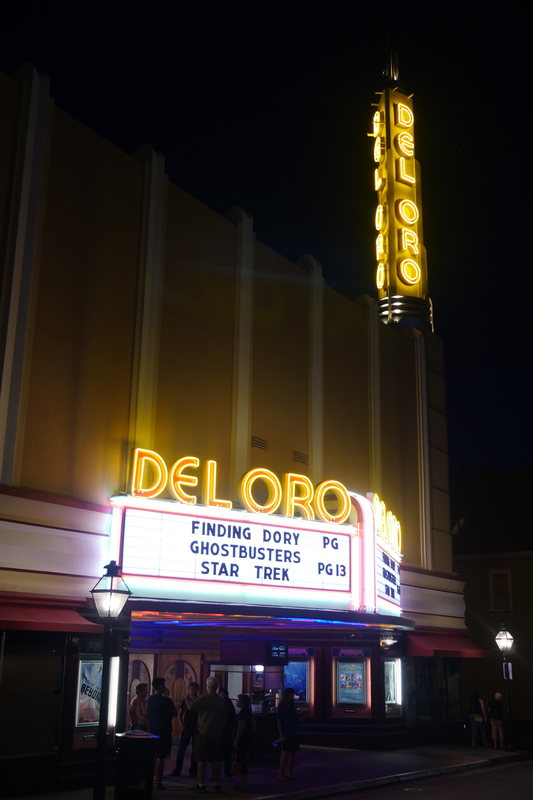 In December 2003, The Getz’s purchased the Del Oro Theatre in downtown Grass Valley and began an extensive remodeling effort, which culminated in the Grand Re-Opening and Tower Lighting ceremony in October, 2004. Thousands of folks filled the streets to witness the lighting of the tower, which had been dark for over 20 years. In 2015, the Del Oro tower and marquee were again refurbished and updated, improving the efficiency and functionality of all the exterior lighting, and bringing the look of the historic building closer to its 1940s origins. 2016 marked the opening of the area's first movie theatre cafe, The CineCafe, at Sierra Cinemas on East Main Street, featuring a variety of local and regional beers on tap, wine by the glass, and a tasty menu to satisfy hungry movie-goers. All food and drinks may be enjoyed in the cafe seating area or in the auditoriums. Now operated by Mike and Barbara's son-in-law Michael LaMarca and daughter Azriel and a team of experienced managers and staff, Sierra Theaters is a true family business committed to quality entertainment for our community. For over 25 years, Sierra Theaters has also been employing and training Nevada County’s youth, giving hundreds of young people their first job. Sierra Cinemas, Del Oro Theatre, and Sutton Cinemas are fully equipped with digital projection and sound, including 3D, with digital assisted listening and closed-captioning devices. Showcasing first-run Hollywood movies, independent and art movies, and live events such as The Metropolitan Opera Live in HD, Sierra Theaters is proud to be the area’s premier movie-going destination.